Great News.. Lymph Node Transfer going well!! This time a year ago I was preparing for my Lymph node Transfer or as I called it “My Lymph Node Transplant”… March 14th 2013 was surgery day. Things did not run as smoothly as I had hoped, after nearly nine hours of surgery I returned to my room, bloated all over, in pain and very uncomfortable, ready to fight all the staff due to the effects of anaesthetic!! Tubes out of everywhere, drains in the surgery sites and still nil by mouth till the next morning, so I could go back to surgery if there was no blood supply to the transferred tissue!!! My daughter wrote about this long day while my family and friends waited for news in the post called “The Big Day” . These are such clear memories for me. I remember laying there thinking, What have I done to myself? Why was I so crazy as to put myself through this? I am all swollen up I have made my Lymphoedema worse!! all these thoughts were buzzing round my head. Then on the second day my temperature went up and the area round the newly implanted nodes was red and hot, cellulitis had hit!!! This was very scary as the infection could destroy the transferred tissue and enclosed nodes. There followed a two-week stay in hospital on IV antibiotics and when I was allowed home another month of oral antibiotics. Three months after my surgery I had an ultrasound to see if any nodes had survived the infection. I was so thrilled when it showed one and maybe a second one… Phewwwww!! It was difficult for the technicians to see as there was still a lot of surgical swelling. Then we come to today, as this is nearly one year post surgery, I was due another ultrasound. I had felt there was some improvement in my lower leg but I have lost all perspective as to what my leg was like. I thought maybe I was just imagining changes!! I am always anxious before any scans or tests and these are no different, especially when this was elective surgery and if there are no nodes then it would all be for nothing. The technician was quite serious and said, “Do you know this is experimental surgery?” I thought oh no he is preparing me for bad news, then his face lit up and he said, “There is one and there is a second and maybe that could be a third.” He did look quite amazed and me I wanted to burst in to tears I was so relieved and happy!! This year has been such an emotional roller coaster it was good to have positive news. My Lymph Node Transfer / Transplant is on track. 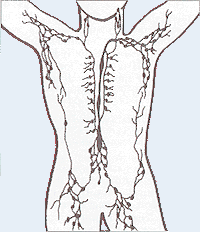 The nodes will continue to grow and create new Lymphatic vessels. It is just so very exciting that this new surgery will shine a light at the end of the tunnel for everyone with Lymphoedema. The more surgery and more experience these surgeons have the better this will become. Thanks Dr Quan Ngo for allowing me this opportunity and to Macquarie University Hospital for allowing me to be part of their research. I see Quan next week and will have measures done and an L-Dex reading as part of the research program. At 18 months and 2 year I will have more measures and scans to check progress.. It is a slow process but this is heading in the right direction!! I would also like to thank EVERYONE who has and is supporting me, my friends and family. To Jennifer who had her Transfer done over a year ahead of me, she has been my guiding light each step of the way. Jennifer was able to tell me what to expect, when I got dishearten she would say, ” Just wait it will be ok! !” To all my friends who have Lymphoedema, you are the people I talk to and you really understand where I am coming from!! To those who have had surgery after me, “Yeh it works!” To my Husband for putting up with some major mood swings over the past year, a big hug to you. ❤❤ To everyone who reads my blog and has helped it to grow and become something very special to me.. The development of breast cancer-related lymphedema is tied closely to how many nodes are removed by surgery. Radiation therapy and chemotherapy can also increase risk. A recent study from Korea (published in (check out the length of the this name!) International Journal of Radiation Oncology Biology Physics, 2013) attempted to estimate the risk of lympededema based on combinations of these treatment factors. The Study: The authors looked at 772 patients with breast cancer. All had primary surgery with axillary node dissection from 2004 to 2009. The study looked back at these patients (retrospective analysis). Adjuvant chemotherapy was given to 677 patients. Of the 675 who got radiation therapy, 35% had a component directed at the nodes above the collarbone (supraclavicular nodes). This is Christine’s story as always in her own words as I find this best conveys their story. “I was so excited to find this blog site. I have suffered from lower left leg lymphedema after uterine cancer in 2009. I had a hysterectomy and 19 nodes removed 10 on one 9 on the other. Immediately after surgery I had swelling in the pubic area that would swell from right to left and settled on the left side. Then in 2010 I flew in a plane with a scratch on my left leg and when the plane landed I noticed both ankles were pretty swollen. The right ankle subsided but the left never did. My oncologist sent me to have a Doppler study done to make sure I didn’t have a blood clot. Then I was sent to a lymphedema center for consult. I was diagnosed with lymphedema and had no clue what it was. No one ever mentioned this to me prior to surgery or after. I did therapy, compression hose, bandaging, and flexitouch. Over time the lymphedema progress up the calf, then knee, upper leg and groin. In 2010 I decided to go back to school and got my BSN. I currently work in the NICU and being on my feet the lymphedema was just completely out of control. I have had to go up 2 shoe sizes just to get one on and 3 sizes in clothes to fit the leg. I only wear long dresses or my scrubs to hide the leg. My leg would swell so bad I couldn’t even bend my knee or ankle. There were times where my skin felt like it would rip open. I have developed bad stretch marks and depression was almost taking me down. I had even told my mom that amputating the leg would be better than this. It was hindering everything about my life. Nothing was working period. I started researching anything for help. 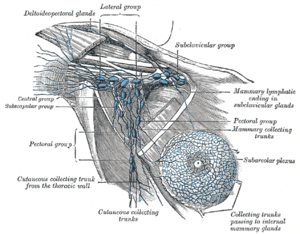 I found articles about Dr. Becker and the lymph node transfer. I flew to California to meet with a surgeon by the name of Ganzow. He said I was a definite candidate for the surgery but he didn’t accept insurance for payment. His fee was $25,000 per cut and told me I would need 3. I didn’t have $75,000 to give him and wait for reimbursement back. He asked me why I didn’t go to MD Anderson in Houston, Dr. David Chang, since I live in Fort Worth. As soon as I got back home I contacted them for an appointment. I had the lymph node scan done with the dye and it showed I had severe lymph blockage as the dye never left my foot on the affected leg. This was done in March 2013. Dr. Chang was a very pleasant and funny doctor. Has a great bedside manner. He informed me that I was a candidate for the surgery and he could do either the lymph node transfer or by-pass which ever I preferred. He said both are good. I told him that I would leave it in his hands to decide and he said that first we have to see what the insurance will pay. Right then I started praying for God to make a way for me. I had my church and everyone praying. I got the call at the beginning of April that my insurance approved BOTH procedures (miracle from God) and Dr. Chang suggested we go ahead with both he was shocked they approved both. Surgery scheduled for June 6. When I arrived in Houston on the 5th for pre-op I had a scan done to determine the difference in size of my left leg from my right. I was at 24% and Dr. Chang said the leg was a lot worse than when he saw me in March and that he wasn’t sure he would be able to do the bypass procedure. I just told him to do what he could do and we would let God do what he couldn’t. My surgery was at 5:15 am and lasted 8 hours. I had a bad reaction to the dye they used in surgery to view the lymph channels which told them they couldn’t do the bypass. They removed lymph nodes from my neck/collar-bone area and transplanted them to the groin. Apparently I had severe scar tissue that was causing a lot of my lymph problems that they cleaned out before transplanting the nodes. When I woke up I had a JP drain in my neck and groin. I was told not to get out of bed period for 48 hours and I couldn’t put any pressure on the groin site. It had big capital letters with a sharpie that said NO PRESSURE. I was in a lot of pain but I have a low tolerance. I am not a back sleeper I sleep on my stomach so I was pretty miserable. I was allergic to the morphine and was itching like crazy everywhere. I was just a hot mess. I was afraid to look at my leg so I didn’t. I was scared to be disappointed. Then this small voice said you trusted Me for this surgery didn’t you? When they unwrapped my leg bandaging I couldn’t believe my eyes. I had toes that didn’t look like sausages and an ankle bone I hadn’t seen in 2 years. Wow!!!!! I was bawling my eyes out. I can’t thank God enough for this miracle in my life. Thank you so much Christine for sharing this with us.. Your account is very open and honest. To answer your question at the end I was not allowed to put compression over the receiver site for a month and as my nodes were placed in the knee I could only wear knee highs. Due to an infection post surgery my recovery and progress went backwards for a bit!!! I am now well on track at 4 months and new scans and MRI to be done at 6 months. Also on my neck scar I use Vitamin E and it has faded very will!! Below are some before and after photos that Christine has taken and allowed me to share…. Christine’s photo of her foot and ankle before surgery. This is after she takes her shoe off. Thank you so much Christine and we look forward to your updates… If anyone else would like to share their story please email me on helenbrd@bigpond.net.au or leave a comment at the bottom of this post I can follow-up on. I thought that I would reblog this to remind myself of how far I have come and for those of you who are new to my blog… this is where it all started!! Hospital was not the best for me, due to an infection but now I am building fitness and hoping those little nodes will grow and create new pathways. I am now 3 months since surgery and wear a compression stocking each day and Ready Wrap sometimes.. lower leg looks good and knee and lower thigh gradually improving.. At six months I will have an MRI and Lymphescitagraph to check progress. I also have regular MLD and Deep Lymphatic Drainage… It is slow progress but in the right direction!!! Lori had surgery on 29th May in New York under Drs Becker and Vasile. Lori travelled from California to have this surgery, having investigated other Doctors, she found she was happiest with their protocol. She wrote to me before the surgery that this was her last hope! Lori is now home and we hope to hear some more updates of her progress, she is hoping to return to swimming as soon as possible.